Who is the Society's Muse? (1939-76) This accomplished amateur astronomer was a member of the Hamilton Centre and recieved the Society's Service Award in 1976. The Society's Chilton Prize is named for him. 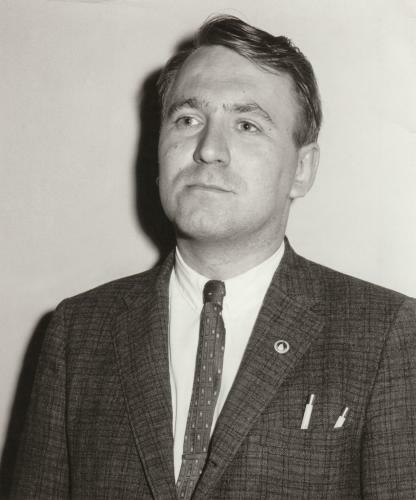 KENNETH E. CHILTON (1939-1976) was a teacher by profession. He joined the Hamilton Centre in 1966 and during his short life, served as Director of Observations, Treasurer, Editor of Orbit, Vice-President, and President. He received the national Service Award in 1976. His expertise as an educator came to the fore in a series of Cable TV programs which he started in 1971, called The Sky Tonight. Thirty-eight programs were aired in the next year. As an observer, he made magnitude estimates for AAVSO from 1966-73. He took part in visual meteor programs, searched for transient lunar phenomena, timed a transit of Mercury, sketched Venus and observed its polarization, wrote articles on observing Mars and observing asteroids, found a correlation between the intensity of Jupiter's South equatorial belt and the position of the satellite Callisto, and studied Saturn's belt zones and rings with his 32 cm Gregorian reflector. Chilton was the obvious person to serve as the national Co-ordinator of Planetary Observations in the late 60's and early 70's when the Society attempted to systematize observations from active members across the country. Under his direction, the Planetary Section was one of the most active in the program. He was also the Chairman of the Co-ordinating Committee for the 1972 Solar Eclipse, visible in many parts of Canada. Ken Chilton took a great interest in the organization of amateur astronomers. He was very eager to promote liaisons between RASC Centres in Ontario and clubs in Western New York State, and served a term as chairman of NFCAAA. But it was as President of the International Union of Amateur Astronomers that he received the recognition which he undoubtedly relished most The IUAA was founded in 1969 as a sort of counterpart of the professional IAU, and indeed was recognized by that body and affiliated with it. Although he endured several years of illness, his energy and enthusiasm were an inspiration to everyone. The Kenneth E. Chilton Prize was established as a tribute to his accomplishments and his spirit. "I know now that I shall never walk among the stars. My wildest dreams, as a youth, was someday I would be able to go and see what's out there. Nor shall I see the completion of my plans and dreams, but if there is a way, then, you know, I shall be there. If you were [out] some night, [and] while looking through your scope, happen to see a strange apperation dancing amongst the stars, then perhaps it may be me; for I shall have found my paradise and the fulfillment of my love for the stars." —Ken Chilton, via Robert Lang. JRASC articles by Ken Chilton. Displaying 13 - 16 of 52 items (page 4 of 13).